All 16 town councils have passed muster in the latest report on their management of HDB estates, with none getting a red mark for the first time since the Government began issuing the report in 2010. Part of the reason could be attributed to the Workers' Party-run town council not being graded in two categories in which it had performed poorly in previous years. These are: corporate governance and management of arrears in payment of service and conservancy charges (S&CC). In the area of corporate governance, all 16 town councils were not graded by the Ministry of National Development (MND). It explained yesterday that because of the Sept 11 General Election, there will be no Town Council (TC) Management Report for October 2015 to March 2016, "as most TCs were in the process of handing over properties to each other, and accountability for results during this transitional period would be unclear''. In the management of S&CC arrears, the former Aljunied-Hougang-Punggol East Town Council (AHPETC) was listed as pending due to an ongoing review by its auditor KPMG. It got a red banding in the previous three reports: in 2012, 2013 and 2014. Town councils were assessed annually in five categories in past reports and were banded green, amber or red in each category. In the latest six-month report,the review was on four categories and "most town councils have performed well in all areas although some could do better in the areas of estate maintenance, and S&CC arrears management ", said the MND. It also noted KPMG had made two observations in its May 2016 report on AHPETC. One, the balances in its accounts receivables sub-ledger as of March 31 last year did not match the trial balances for the same period. The other is the accounts receivables sub-ledger - used to calculate AHPETC's S&CC arrears attributable to its sinking fund - did not match the numbers in its FY2014/15 audited financial statements. The town council is investigating the reasons for the difference. Mr Pritam Singh, chairman of the Aljunied-Hougang Town Council, said it noted the MND's remarks on its S&CC arrears management, and will continue to publish on its website all monthly KPMG reports "for the public to track the progress and resolution of the issue". The other town council that did not get top marks in S&CC arrears management was Potong Pasir Town Council. Its grade was amber. Its chairman, Mr Sitoh Yih Pin, said the situation has been "improving gradually'' since he took over the single-seat constituency from the Singapore People's Party. "In May 2011 when we took over, the statistic was 7.44 per cent, and as at end April 2016, it was 3.01 per cent," said Mr Sitoh. Generally, a green band means fewer than 4 per cent of households owe arrears for three or more months, and less than 40 per cent of collectible S&CC is overdue. 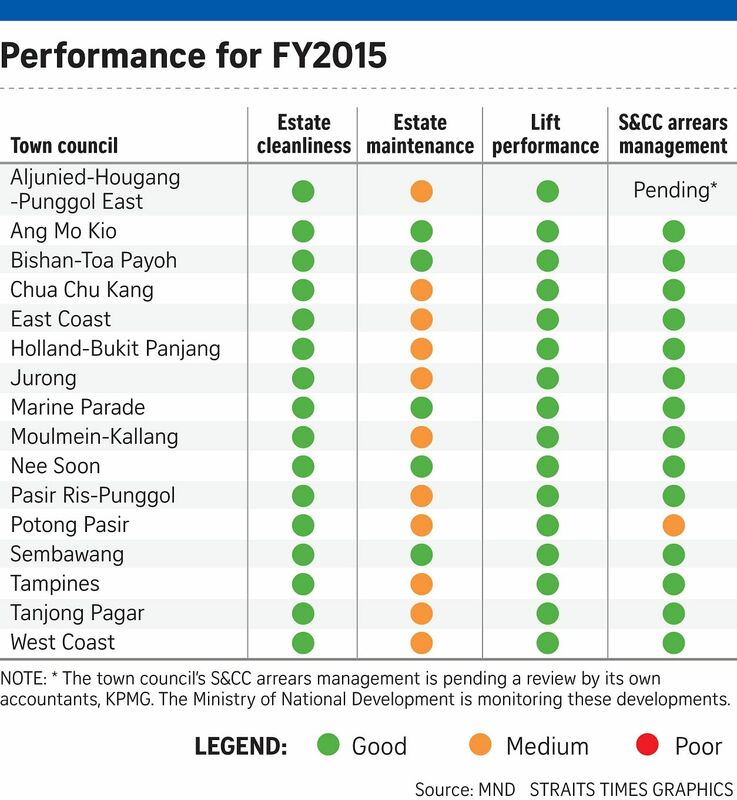 As with last year's report, all town councils were banded green in estate cleanliness and lift performance. Estate maintenance remains the most widespread issue, with 11 of the 16 town councils banded amber compared with 10 the year before. For estate management, MND said the sticking point was obstruction of common areas, which was a top maintenance issue for 15 of the 16 town councils. "Such obstructions are potential fire hazards and can hamper evacuation efforts during emergencies," said the report. Audit and disclosure expert Mak Yuen Teen said: "Town councils need to establish what is clearly dangerous from a safety standpoint and, beyond this, they may have to cut residents some slack. "Similarly, MND may need to do the same."